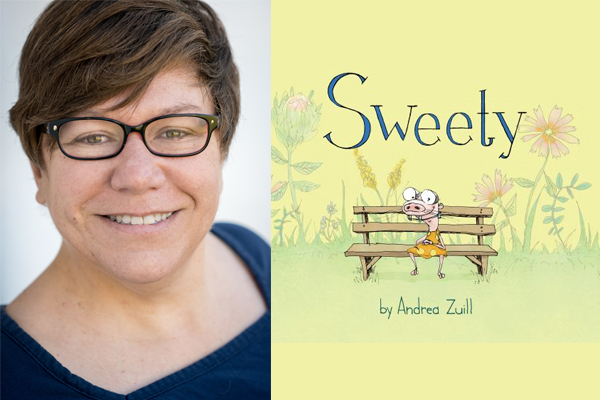 If you’re looking for something sweet, look no farther than an afternoon with Andrea Zuill, author of WOLF CAMP, and her newest picture book, SWEETY. SWEETY is the story of a naked mole rat who feels awkward and different from her peers. With some help, Sweety comes to love herself and all the qualities that make her unique. It’s a message and an event that’ll resonate with anyone still learning to embrace who they really are. After her discussion, Andrea will sign copies of her books. Sweety is awkward, even for a naked mole rat. She has protruding front teeth, thick glasses, and some very unusual hobbies, including interpretive dance and fungus identification. She’s intense and passionate—and her peers don’t always get her. But surely there are other mushroom lovers out there? As Sweety sets out to find them, she comes to realize—with a little help from her cool Aunt Ruth—that being Sweety is actually pretty awesome. With heart and humor and a whole lot of charm, Andrea Zuill delivers a story about learning to embrace everything that makes you you—and that’s something many kids are going to relate to. Andrea Zuill is the author-illustrator of WOLF CAMP, a finalist for the Children’s Choice Award. In a starred review, Kirkus said the book “will delight more than dog lovers.” She is also the author-illustrator of DANCE IS FOR EVERYONE and MARIGOLD & DAISY. Her work has been exhibited in galleries in California, Texas, and New York, including the San Diego Museum of Art and the Brand Library gallery, where she won the Disney Imagineering Award. Visit her at andreazuill.org or follow her on Twitter at @AndreaZuill.